One must shed body-consciousness in order to merge with the Absolute. This is the spiritual instruction that has been imparted to us. By controlling the cravings of the senses and reducing desires, we strive to free ourselves from body-attachment. However, this does not mean we must ignore or neglect the body. On the contrary, Baba says the body must be meticulously looked after, for it is the temple of the soul. He may take the illness of devotees directly upon Himself. In some cases, the devotees may not even know of the illness that has attacked their bodies. On other occasions, He simply cures the ailing patient by showering His Grace. These are the miraculous cures described by devotees. But for the others, the thousands of those who are in need of medical attention, Baba has set up four hospitals, two in Puttaparthi and two in Bangalore. 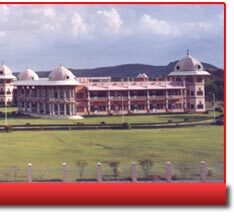 And through His auspices, hundreds of Sai hospitals, mobile clinics and medical camps are run under the Sri Sathya Sai Healthcare Project. All these hospitals provide free medical care – and have no cash counters! 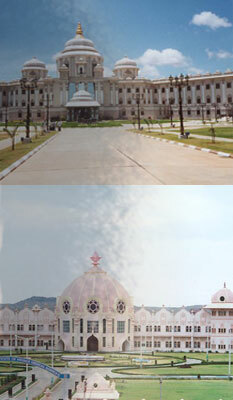 The first hospital was set up at Prasanthi Nilayam in 1957, adjacent to the Mandir. 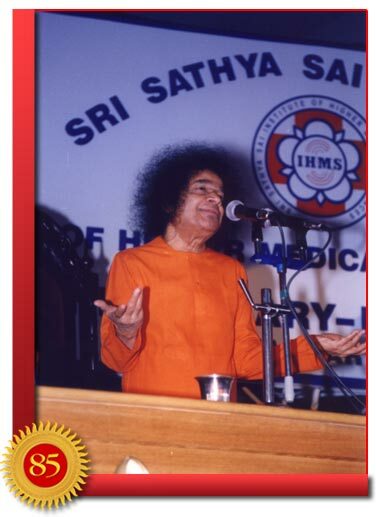 To further His mission and to satisfy the wish of Mother Easwaramma, Baba established the modest unit that was truly a godsend for the people of Puttaparthi as it was the only one for quite some distance around. 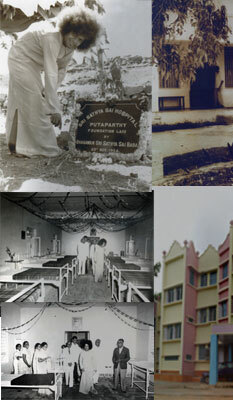 In 1976, Baba ensured the completion of a general hospital in Whitefield. 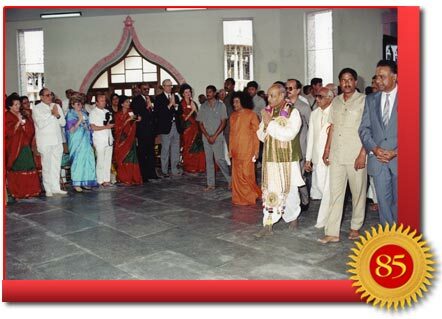 It was affectionately called Swami’s ‘little hospital’ as it was solely meant to serve as a primary healthcare centre. Today and remarkably so, the hospital has grown to offer many specialties and draws over 500 outpatients each day. 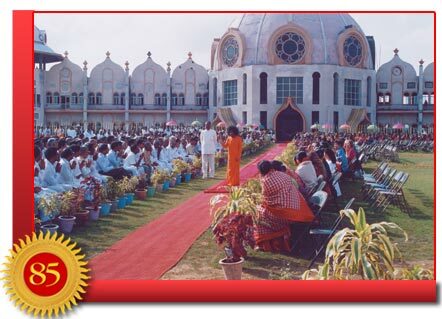 On 23 November 1990, Swami ushered in a new era in the history of healthcare in the world. It was on his 65th birthday, when a sea of humanity had gathered at Prashanti Nilayam. When Baba made this grand declaration, many hailed it. But an equal number in the medical fraternity doubted the possibility. And for this, they had good reasons because there was not even a plan on paper for the hospital on that day. 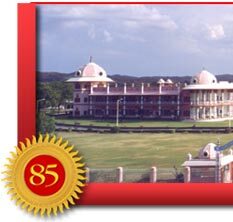 When the students from Bhagavan’s Institute went to the All India Institute of Medical Sciences in New Delhi for training, they were mocked by the medical professionals there. Their derision came from their lack of faith in the Sankalpa (Supreme Will) of the Divine. Baba recruited accomplished men for His sacred mission - leaders in their fields of endeavour. 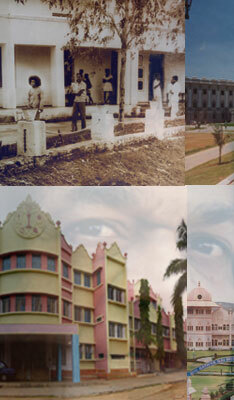 The team included a leading expert in sacred architecture from the Prince of Wales School of Architecture in London; the chief of the structural engineering wing of a celebrated construction company in Chennai; a notable cardiac surgeon, head of his department at the All India Institute of Medical Sciences, New Delhi; a celebrated businessman of an established chain, and several others. The experts convened committees comprising industry achievers to tackle the enormous challenges involved in the creation of a state-of-the-art Super Specialty Hospital in less than a year. However, right from the start, circumstances seemed to favour the naysayers. Communication between the London architectural firm and the Indian construction team was erratic. Serious activity did not begin on the site until May 1991, six months before the deadline. With this assurance from Baba, both Dr. Ramakrishna and Col. Rao applied themselves to their tasks with renewed energy. They marshalled 2,000 men and women who worked round the clock in shifts. 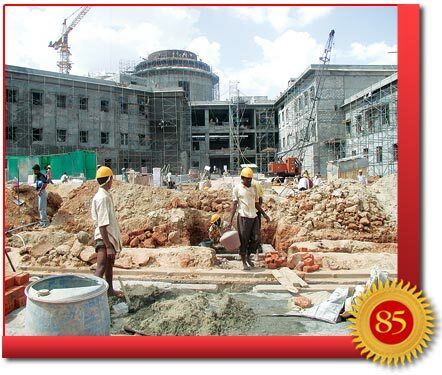 Amidst all the ongoing work, there was one unifying thread that permeated the activity and filled the minds of all the workers - from the highest to the lowest – that they were doing God’s work: building a super specialty hospital for the poor. 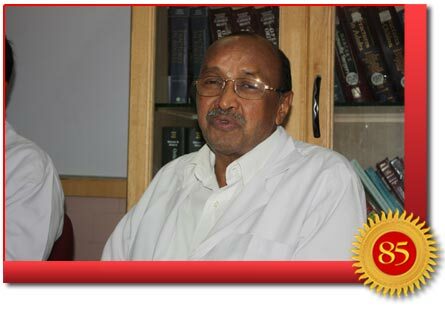 Dr. Safaya, Director of the Hospital, recalls: “Three days before the deadline on 18 November, I returned to my room at midnight tired and crestfallen. Suddenly, tears started rolling down from my eyes and I was sobbing softly. Such a thing had never happened to me before. I told my wife, ‘I have failed my Master, my Swami. There are only three days left. We will not be able to open the hospital for surgery on the 22nd. We have not been able to keep to the dates of the work schedule. We do not have yet the sterile operation theatres, intensive care area, and catheterisation laboratories ready. Blood bank is not yet operational; we should have a least 30 numbers of properly grouped and tested blood units ready. Nothing can be done now and I have failed Him. Let us pack and run away to Delhi’. 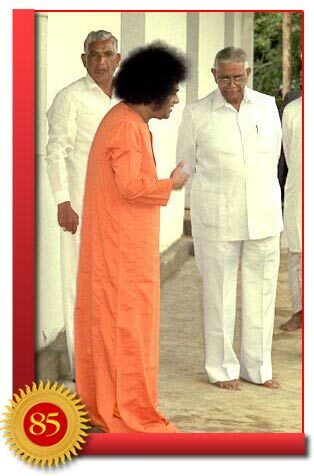 On the morning of 22 November 1991, Mr. P. V. Narasimha Rao, the then Prime Minister of India, approached Bhagavan with folded palms and offered Him his pranams. The two walked on the red carpet to the massive and exquisitely carved door at the entrance to the central hall of the building. The Prime Minister cut the ribbon and entered the hall. There, under the grand multi-colored dome, Bhagavan introduced him to the doctors and others who were there to receive him. The operation theatre was blessed by Bhagavan and the surgeon’s knife touched the skin of the first heart patient at 9:00 a.m. This was exactly as predicted the previous year by Bhagavan in His declaration to the public. Baba’s will, His Sankalpa, cannot be denied. The next morning, on the occasion of His 56th birthday, Baba spoke to the huge audience in the Vidyagiri Stadium: “The government is seeking to provide various amenities in the villages. But it is one thing to proclaim one’s intentions and quite another to fulfill then. Speaking is easy; acting is difficult. Neither the authorities nor the leaders appear to be concerned about the plight of the villagers. The villagers are also apathetic. Bharath is not lacking in resources. It is well endowed in every respect. Had it not been so, it would not have attracted so many invaders from the outside. Today, Bharathiyas themselves are considering their country as poor and belittling its status. This by itself is not a great danger. The greater danger is the development of a mood of cynicism. It is only when the pessimism among the people is transformed to robust optimism will the country march forward. “This hamlet of Puttaparthi had a population of barely 800. To conceive of a university for such a village was a fantastic dream. Another amazing phenomenon is the construction of an aerodrome near such a village. 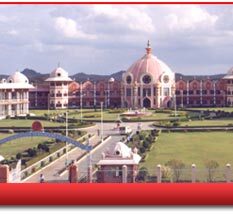 Puttaparthi has become the cynosure of all eyes in the world. 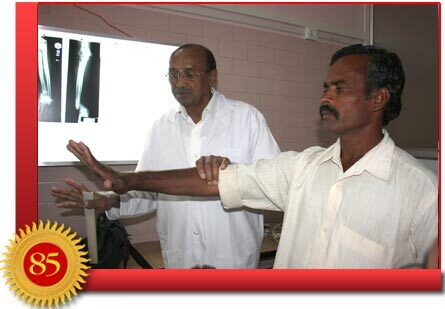 To date, over 10,000 operations have been performed at the hospital in Puttaparthi. Many of these were heart patients. 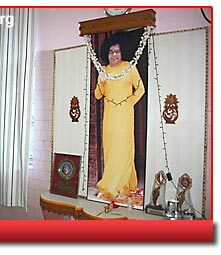 Baba stated years later at the time of the inauguration of the second super specialty hospital in Whitefield that in the villages surrounding Puttaparthi no one suffers from diseases of the heart any more. 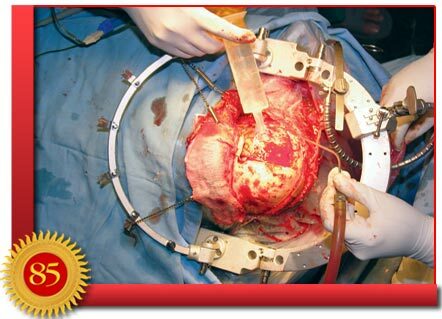 The hospital has also conducted other types of challenging surgeries. Let us look at the case of Narayan Reddy, a resident of Surarana Palli, a village off the highway connecting Anantapur to Bangalore. One evening, it was twilight when he started for Penukonda on his scooter. Just a few kilometres from his home, he saw a van approaching from the opposite direction. Out of control, it headed straight towards him. In an effort to save himself, Reddy took an evasive action to the left. But the van seemed to follow him. In a blur, the vehicle crashed into the handle bar of his scooter, throwing Reddy off. When he came to, he realised he was in an ambulance with excruciating pain shooting up from his right hand. It was not hard to guess why. 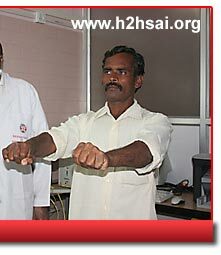 Narayan Reddy’s right hand was an awful sight. The palm was detached from the wrist, hanging only by the skin. The bones had pierced the flesh and were protruding, while blood flowed in streams. Reddy was rushed to the hospital in nearby Penukonda, a town 50 kilometres from Puttaparthi. Most of the doctors Reddy visited gave him little hope regarding the recovery of the damaged hand. A majority of them gave him a curt ‘no,’ while the rest said that even if he paid them the fat amount needed for the surgery, there was only a slim chance his right hand would become as good as it was earlier. Reddy shares: “I am a farmer and with the right hand rendered useless, I could not carry out my work. I could neither take a bath properly nor eat with my right hand. Even holding a tumbler or a piece of soap was difficult. I felt miserable and was worried about mine and my family’s future. 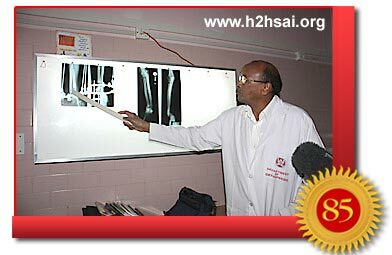 That was when an acquaintance told him about the Department of Orthopaedics at the Sri Sathya Sai Institute of Higher Medical Sciences in Puttaparthi. 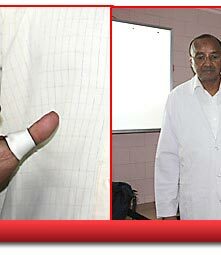 Dr. Kailash Rao, Head of the Department of Orthopaedics at the Institute, recalls that Reddy’s wrist was flexed in one direction and his hand was totally stiff. 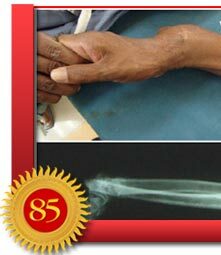 He says: “He had intense pain in his hand. When he came to the hospital, he urged us to help him out so he could use his right hand and earn a living. “This was a really challenging case for us. In fact, we had seen very few cases of such complexity. Even the visiting experts who were here were flabbergasted when they examined him. They said to give a working hand to Reddy would be a real test of our skills. During the discussion, one doctor suggested that we fuse the wrist in a fixed position. 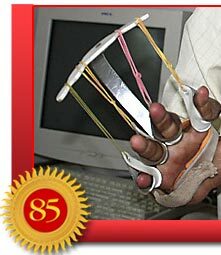 Though the patient would not have any mobility, he may get a part of the functions of the hand. Dr Kailash Rao’s subsequent words on his coincidental introduction to the Ilizarov system of treatment leaves little room for doubt that Reddy’s cure was nothing short of a miracle. The Ilizarov treatment involves the use of wires and rings. The wires are passed through the bones and held secure by the rings. By manipulating the rings, tension is applied to the bones and the deformities are corrected gradually. It is a minimally invasive procedure where the wires are introduced through a small incision in the tissues. Since the correction is slow, occurring over some length of time, the body produces the natural formation of tissue, tendons, blood vessels and nerves to accommodate the minute changes occurring in the skeletal structure. Since then, the Department of Orthopaedics has been utilising the Ilizarov method extensively. Children with deformed feet have been set right; limbs rendered defunct as a result of fractures, refusing to join, have been stitched; abnormally short hands and feet have been lengthened, and the cases declared elsewhere as ‘beyond treatment’ have been corrected. When doctors express loving concern for their patients, the patients respond with love and are healed thereby. This is the daily routine in Baba’s Super Specialty Hospitals and in the various Sai Hospitals that have recently come into being. Here, the only exchange for medical services is love. These institutions are changing the methods of healing by their success. For thousands – whose life had become a continuous nightmare – they have restored hope and joy.